Summary: Nobody's ever really explained the Spill. Was it an angelic visitation? A nanotech accident? A porthole opening from another world? 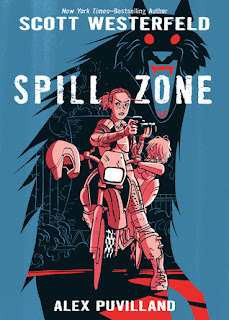 Whatever it was, no one's allowed in the Spill Zone these days except government scientists and hazmat teams. But a few intrepid explorers know how to sneak through the patrols and steer clear of the dangers inside the Zone. Addison Merrick is one such explorer, dedicated to finding out what happened that night, and to unraveling the events that took her parents and left her little sister mute and disconnected from the world. I AM NOT WILLING TO READ WHAT MY KID LIKES. It was YA! I didn't know there were graphic novels that were more mature. For all those graphic novel and manga lovers, I'm sorry, I just didn't know. The cover was WAY too shiny to pass up. It literally has a blue sheen to it and it just calls to a bibliophile like a freaking Siren. I sat right on my front porch and read Spill Zone in about an hour. It took an hour because I got so wrapped up in all the pictures. Remember, I'm a #newb. Now, I totally understand why my daughter loves graphic novels. The pictures gave me a bit of a break from reading and let my mind wonder about the story before moving on. It's a twisted little story and the creepy vibe was on-point. The storyline is multi-layered and is definitely for a more mature audience. I think this series will easily capture new audiences not from the GN genre simply because the story is a bit dark and the world building has the potential to be huge. I'm not sure where the story is headed but in the end I was left hanging with a new fear of all things Raggedy Ann & Andy; I will never think of those dolls the same way. Thanks Westerfeld, I'll be digging out those dolls and using them for Halloween props this year.